a type of breathing exercise that patients are taught to promote more effective aeration of the lungs, consisting of moving the diaphragm downward during inhalation and upward with exhalation. frog breathing (glossopharyngeal breathing) respiration unaided by the primary or ordinary accessory muscles of respiration, the air being “swallowed” rapidly into the lungs by use of the tongue and the muscles of the pharynx; used by patients with chronic muscle paralysis to augment their vital capacity. intermittent positive pressure breathing (IPPB) see intermittent positive pressure breathing. mouth breathing breathing through the mouth instead of the nose, usually because of some obstruction in the nasal passages. breathing pattern, ineffective a nursing diagnosis approved by the North American Nursing Diagnosis Association, defined as inspiration and/or expiration that does not provide adequate ventilation. Etiologic and contributing factors include disorders of the nervous system in which there is abnormal response to neural stimulation, as in spinal cord injury; impairment of musculoskeletal function, as in trauma to the chest; pain and discomfort associated with deep breathing, as after abdominal or thoracic surgery; fatigue and diminished energy level; inadequate lung expansion, as in poor body posture and positioning; inappropriate response to stress, as in hyperventilation; inflammation of respiratory structures; and tracheobronchial obstruction. Subjective symptoms include reports of dyspnea, shortness of breath, pain associated with breathing, complaints of dizziness, and previous episodes of emotional or physical stress or fear and anxiety. Objective symptoms include increased respiratory rate and changes in depth of respirations, fremitus, abnormal arterial blood gases, nasal flaring, orthopnea or assumption of the three-point position, in which the patient sits down and elevates the shoulders by stiffening each arm and pushing downward with the hands on the chair or bed, use of accessory muscles of respiration, increased anteroposterior diameter of chest (barrel chest), and altered chest excursion. The goal of nursing intervention is to help the patient experience improved gas exchange by using a more effective breathing pattern. This might include teaching appropriate breathing exercises and proper use of accessory muscles of respiration, and encouraging body posture that maximizes expansion of the lungs. If postoperative pain is a contributing factor, providing support of the operative site to reduce strain during coughing or moving about could encourage deeper respirations and a more normal breathing pattern. If a causative factor is stress with resultant hyperventilation or some other ineffective breathing pattern, the patient may need help in developing more beneficial coping mechanisms such as relaxation techniques. pursed-lip breathing a breathing technique in which air is inhaled slowly through the nose and then exhaled slowly through pursed lips. This type of breathing is often used by patients with chronic obstructive pulmonary disease to prevent small airway collapse. breathing-related sleep disorder any of several disorders characterized by sleep disruption due to some sleep-related breathing problem, resulting in excessive sleepiness or insomnia. Included are central and obstructive sleep apnea syndromes (see adult sleep apnea). Inhalation and exhalation of air or gaseous mixtures. frog breathing , glossopharyngeal breathing breathing in which air is “swallowed” into the lungs by the tongue and muscles of the pharynx, unaided by primary or ordinary accessory muscles of respiration; used by those with chronic muscle paralysis to augment their breathing. intermittent positive pressure breathing the active inflation of the lungs during inhalation under positive pressure from a cycling valve. The act of breathing—many forms of alternative healthcare emphasise proper breathing. The mechanical component of breathing is divided into two components: chest breathing, which is under voluntary control; and the more rhythmic diaphragmatic breathing, which is primarily involuntary and therefore more natural. Breathing techniques focus on improving diaphragmatic breathing, which allows a fuller expansion of the lungs and a decrease in carbon dioxide and lactic acid. Improper breathing is believed by some alternative healthcare providers to have an adverse effect on the nervous system, resulting in anxiety, stress, insomnia and exhaustion. A local unfolding of a polypeptide to allow exchange of one isotope for another. Respiration; the act of inhaling and exhaling. A local unwinding of the DNA double helix to allow formation of transcription bubbles; alternately, the "chaotic” transient rupture and reforming of inter-chain hydrogen bonds that facilitates the interaction with the regulatory DNA-binding proteins. Chest medicine Respiration; the act of inhaling and exhaling air. 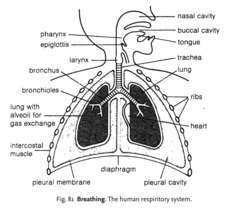 See Biot breathing, Cheynes-Stokes breathing, Noisy breathing, Rescue breathing. The automatic, and usually unconscious, process by which air is drawn into the LUNGS for the purpose of oxygenating the blood and disposing of carbon dioxide. Breathing involves a periodic increase in the volume of the chest occasioned by the raising and outward movement of the ribs and the flattening of the domed DIAPHRAGM. This is an active process involving muscle contraction and results in air being forced into the lungs by atmospheric pressure. Expiration is passive, the air escaping as a result of elastic recoil of the lungs and relaxation of the respiratory muscles. Fig. 83 Breathing . 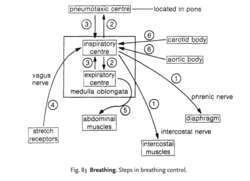 Steps in breathing control. Fig. 82 Breathing . Expansion and relaxation of the chest during breathing. Fig. 81 Breathing . The human respiritory system. a process in which air is taken into the lungs (inspiration) and then expelled from the lungs (expiration). In a mammal such as man the structures involved are as shown in Fig. 81. Inspiration occurs when the rib cage and the DIAPHRAGM alter shape to increase the volume and reduce the pressure in the thoracic cavity. The ribs are drawn up and outwards by contraction of the external INTERCOSTAL MUSCLES (chest breathing), while contraction of the diaphragm causes it to flatten downwards (abdominal breathing). Expiration can be simply a passive process in which the muscles relax, causing the ribs to drop down and inwards and the diaphragm to curve upwards. These movements reduce the thoracic volume which, along with elastic recoil of the lungs, results in a raising of the internal pressure so that air is expelled. Forced expiration can also occur where the abdominal muscles force the diaphragm further up into the thoracic cavity. spontaneous nerve impulses are generated in the inspiratory centre which cause contraction of the intercostal muscle (via intercostal nerve) and the diaphragm (via phrenic nerve). The thoracic volume increases. the pneumotaxic and expiratory centres are excited by impulses from the inspiratory centre. when sufficiently excited the pneumotaxic and expiratory centres send inhibitory signals to the inspiratory centre. at the same time as (c), stretch receptors in the walls of the lungs become excited and begin to send inhibitory signals (via the vagus nerve) to the inspiratory centre, which eventually stops stimulating the intercostal muscle and the diaphragm so that they now relax. the expiratory centre stimulates contraction of the abdominal muscles. Steps (d) and (e) cause reduction of thoracic volume so that the stretch receptors are no longer stimulated. As a result the breathing cycle begins again at step (a). finally, there is a chemical method of control. Excess carbon dioxide in the blood causes a lowering of pH which is detected in the AORTIC BODY and the CAROTID BODY as well as the respiratory centre itself. As a result, the inspiratory centre is stimulated to produce deeper breathing so as to reduce the level of CO2 in the blood. This negative FEEDBACK MECHANISM thus relies not on oxygen levels but rather on CO2 levels to control breathing rate. See Fig. 83 .
the regular inflation and deflation of the lungs, serving the purpose of respiratory gas exchange aka pulmonary ventilation . Breathing and its pattern - the depth and frequency of breaths - are controlled by a group of neurons in the brain stem, and vary in response to changes in afferent information from several sites, notably the chemoreceptors (sensitive to changes in oxygen, CO2 and pH in arterial blood, and to the pH in the brain) and from muscles and joints (which signal changes in activity). The output from this 'respiratory centre' regulates, via the phrenic nerves, the frequency and strength of contraction of the diaphragm, which accounts alone for breathing at rest. With increasing demand, the intercostal muscles contribute additional lung inflation/deflation by their action on the size and shape of the ribcage, assisted when breathing is deepest by the accessory muscles of respiration, including neck, chest and abdominal muscles. See also apnoea, dyspnoea, ventilation. the alternate inspiration and expiration of air into and out of the lungs (see also respiration). the active inflation of the lungs during inspiration under positive pressure from a cycling valve. see periodic breathing, biot's respirations, cheyne-stokes respiration. At rest, normal breathing should be a quiet process needing little effort. In a two-day workshop they teach nationwide, this husband and wife duo help people return to a more natural breathing rhythm, through a technique they developed call Qi Breathing. Implications: Simple breathing exercises have the ability to improve and even reverse chronic health problems including asthma, sleep apnoea, hypertension, headaches, irritable bowel syndrome, reflux and anxiety. There is a proverb that bears repeating: The nose is for breathing, while the mouth is for eating. Their study - which marks the first time researchers have stimulated the amygdala in humans and reported loss of breathing - is published in the July 15 issue of the Journal of Neuroscience. The workshop is focused to train health professionals to immediately dry and warm the babies and to start breathing for babies with a bag and mask if they do not breathe on their own within one minute. Deep breathing is found to have a positive impact on memory. We rarely give our breathing much thought, yet we have this amazing tool at our disposal, that can calm us very quickly as well as relieve stress. com) is a huge believer in the importance of breathing properly. Breathing connects a myriad of states, say experts. This breathing exercise should be done for 5 minutes every morning as it recharges you for the day. Bizarre as it might seem, breathing is something most people do poorly, Dennis LEWIS writes in "Free your Breath and free your life.